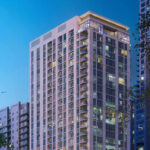 YotelPad is an international brand located in Downtown Miami, within walking distance of Miami's best restaurants, famous shopping and malls, such as the new Brickell City Center, and other entertainment venues. YotelPad is a unique design that includes modernity, luxury and comfort. Studio apartments T1 and T2 that can be rented by season, with no time restriction in the area that is most valued in Miami! 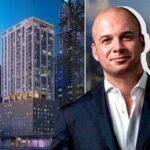 Brokers for Yotelpad announced yesterday in a press release that they have broken the sales record for a downtown Miami, becoming the fastest selling project ever. OneWorld Properties, which is leading sales, says that 75 percent of units have now been sold. The project will include 231 residential units and 222 hotel rooms, meaning over 170 condos have been sold. The milestone was achieved in under nine months, with sales first getting underway in June 2018. The hard-court tennis courts will be situated on the building's renowned first-of-its-kind Upper Deck, which will debut as the largest amenity deck in the U.S. spanning 90 feet above Downtown Miami. 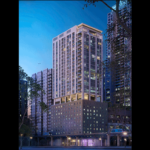 Este es el primer edificio en vender más de 50 por ciento del proyecto en un semestre, "a razón de 18 unidades por mes, marcando un récord en el mercado inmobiliario estadounidense"
Yotel, known for its “affordable luxury hotels” in New York, Singapore, Boston and San Francisco broke ground on a new mixed-use residential building in downtown Miami. The high-rise’s bottom floors will be made up by hotel rooms and the top floors of the building will be condos. Referred to as “Pads” by Yotel, these condos will be built with apps like Airbnb in mind, as there are “zero rental restrictions” on the Pads, freeing owners to rent out spaces to temporary guests. The project broke ground on Jan. 31 and is expected to be completed by early 2021. The project is being overseen by Aria Development Group. 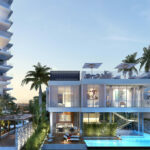 Since the launch of the project, 50 percent of the residences have already been sold. 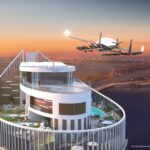 The sales and marketing team of the Yotelpad project, OneWorld Properties, reached this milestone only 6 months after the launch of the building. 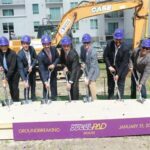 Yotelpad Miami will include three Techi robot butlers to deliver food, drinks, documents and gifts and can also be programmed to speak a variety of languages and play music and other audio files. The building, when finished, will have 231 “pads” and 222 hotel rooms. 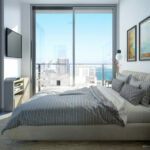 Prices for residences start in the $300,000 range. Aria Development Group, in partnership with Aqarat, has begun construction on Yotelpad, a 327,356 square-foot, mixed-use project in Miami. Stantec is providing architecture, interior design and engineering services for the 231-condo and 222-key development, which is slated for completion in early 2021.